Tonight was one of those exhilarating nights of personal discovery and celebration of the human spirit. I cracked one of my lamb shanks out of the confit fat! To pause momentarily, I'd like to mention that's it's something of a tug-of-war to get one of these shanks out of the fat. The fat is like a vacuum seal and really gets a grip in the meat. Given the already tender nature of the slow cooked lamb, I ended up scraping a few lumps of lamb out of their fatty tomb. But wow, was this ever worth it. I'm a big fan of duck confit, but the irresistibly meaty, brawny nature of the lamb confit made the shanks taste out of this world. Perhaps homemade duck confit would taste just as good. Perhaps it's from making my own fresh lard from a free-range hog. And it's probably the novelty of experiencing the taste of lamb in a new way. Whatever it was, the lamb was insanely delicious. I still have endorphin chills racing down my spine and up the crest of my skull just thinking about that flavor. 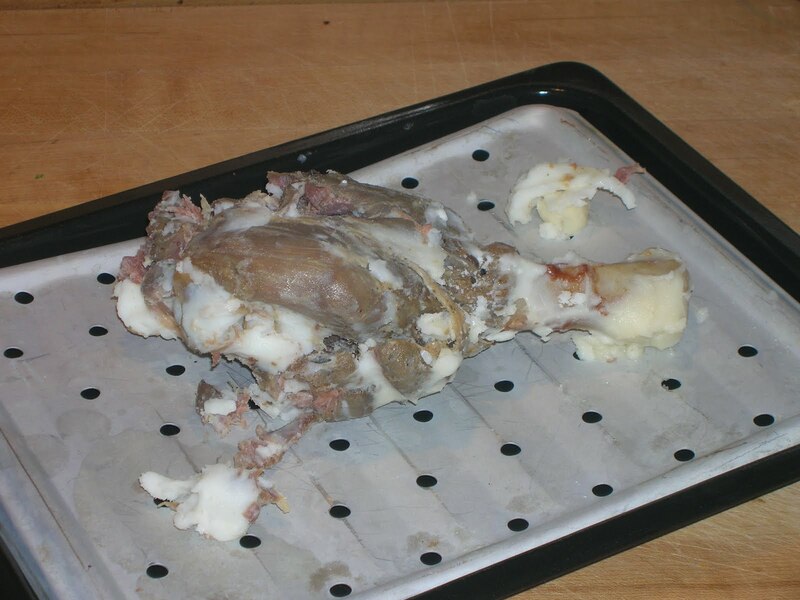 So here's what I did: I popped the shanks out from their lard-crypt and put them on a perforated pan. Don't worry about scraping the fat off, it'll all run off after a minute in the 400 F oven. While the oven is preheating, I cooked some lentils in a broth of 1/2 water and 1/2 crushed tomatoes. 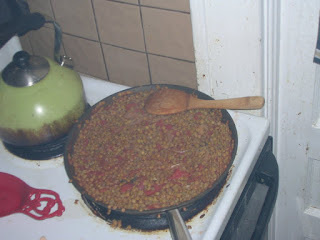 An onion and dried chile rounded everything out. I also made a garlicky cream sauce out of some leftover raw milk. Carla purloined all my whey ricotta from the weekend's cheesemaking, so I only had 1.5 cups of raw milk left. I simmered the milk with 5 minced garlic cloves until it thickened to 1/2 C.
Pop the lamb in the hot oven for 12-15 min while the lentils cook through and the sauce reduces. Once the lamb is warmed through, turn the oven to broil for a min or two to get it crispy and sizzling on the surface. 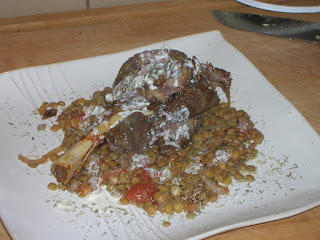 Get your plate, make a nest of lentils, then lay in the lamb. Drizzle with garlic sauce and splash on a slightly too-large pinch of herbs de provence. Then indulge in the rich flavor of succulent, heavenly lamb. I need to make this again. In greater quantity.